The U.S deficit has declined nearly 20% since the same period last year. Over the last 12 months, a surplus brought the budget down to $431 billion. The surplus in June was reported to come in at $52 billion, which is the lowest in seven years. This is a big surprise for many but many things have changed. The economic outlook is better. Revenues is higher and the dollar is still climbing higher. The budget could have been much more different if the US spent less on military spending. But, no way. Always money for war but not for peace and people. Security is important, but not at the expense of all else. It seems like a $391 Billion F-35 jet boondoggle (2,457 planes) is more important than education and healthcare (it is the most expensive weapons system in world history). Pentagon will spend more than $1 trillion on its JSF program, according to Government Accountability Office. Is it worth it? China will pretty soon spend more on R&D than USA and Europe combined! President Barrack Obama has earlier said that the military spending should rise for defense. The military spending has never been higher than it is today. We know from history that the more USA is spending, the more will other countries follow them and spend even more on bombs and weapons. Let`s take a look at the history. President Bush Sr and President Clinton made huge cuts in military spending between 1992 and 1994. Reagan spent $565,0 billion in 1982 – 1989. It dropped down to $513,4 billion per year under Bush Sr in 1990 – 1993. It dropped even more under Clinton from 1994 – 2001. The military spending under Clinton declined to $418,0 billion per year. That`s lower than Carter`s spending in 1978 – 1981, at $428,1 billion per year. The military spending skyrocketed. Up more than 50%! 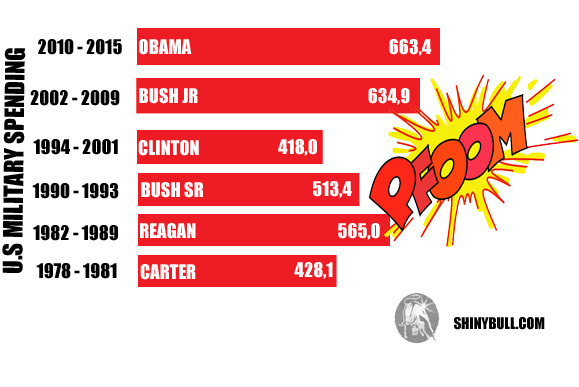 Bush Jr spent $634,9 billion per year from 2002 – 2009. Obama`s budget is $610,0 billion per year (2010 – 2015), and he wants to rise the numbers. All numbers are inflation-adjusted, and do not include spending on CIA, VA, Homeland Security, Energy, Justice, interest payments on past military spending or State Departments. It seems like the more countries around the world spend on the military, the more chaos, violence and instability we get, and no one spend more money on defence than USA. The United States military receives more funding that the rest of the ten largest militaries in the world combined. The highest military spending in 2014 is accounted for USA at the top with $610,0 billion, which is 182% more than China at $216 billion. Russia; only $84,5 billion, followed by Saudi Arabia at $80,8 and France; $62,3 billion. For example; China spend four times more on military spending now than 15 years ago. Their economy is also growing rapidly. 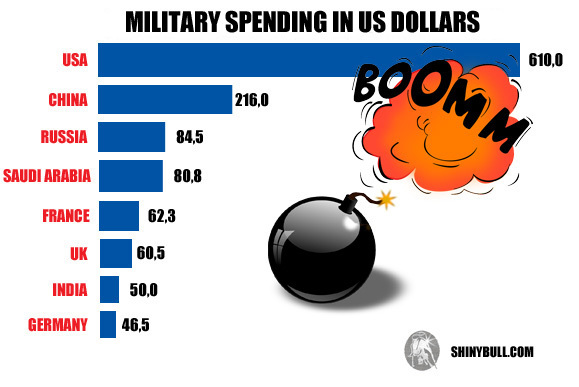 The bigger the economy is, the bigger the military budget measured in money is. USA is at the top because it is the worlds largest economy, despite the fact that China have four times as much people. USA spend 3,5% of its GDP on military spending. That doesn`t mean they are the country in this world to spend most of their money on military, because (belive it or not) no one spend more money on military than Saudi Arabia (measured by a % of GDP). 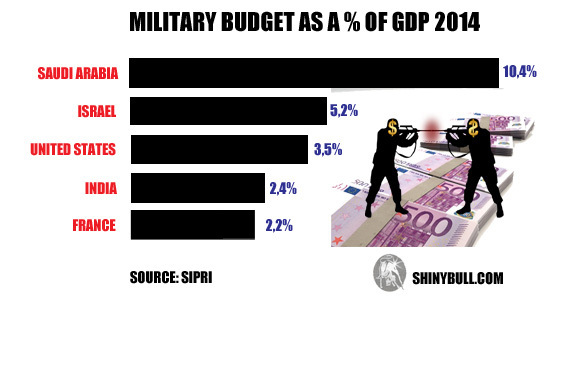 Saudi Arabi spend 10,4% of its GDP on military. They are now on top of that list, replacing India which is now number four. Saudi Arabia is the world`s largest importer of defense equipment, and between 2013 and 2014, Saudi Arabia`s arms import increased over 50%. United Arab Emirates and Saudi Arabia imported more on defense imports than Western Europe combined. United Kingdom are spending more on military than ever before. India is number two on the list, followed by China. India imported $5,57 billion on military hardware. China; $2,6 billion. New report reveals that Russia has now doubled its spending from last years 4,5% of GDP. Keep in mind that most of the European countries spend about 2% of their GDP to NATO. You can imagine how powerful the USA/NATO alliance is? The vision is to protect alliance-countries, not attack other countries. The flow of weapons shows few signs of slowing down. Military forces are destructive. Guns and bombs are designed to hurt people and destroy things. Countries spend money on bombs and guns because they want to defend themselves against other aggressive nations. The more use of forces and deaths and destruction, the more resistance and widespread instability in the world we will see. So, what is the point? «We kill people who kill people because killing people is wrong». What strategy is that? I heard Yo Dwarg once said: «I heard you throw bombs on people who throw bombs at you because you are throwing bombs at them so they will stop throwing bombs at you. Just wanted to ask how it`s working so far». Let`s face it: War is stupid. A lose-lose strategy. No winners. Or……. War can be very profitable for someone. General Dynamics are the largest U.S producers of bombs and ammunition, so war in Iraq, Libya, Afghanistan and Syria is very profitable for them. It`s also very profitable for banks. 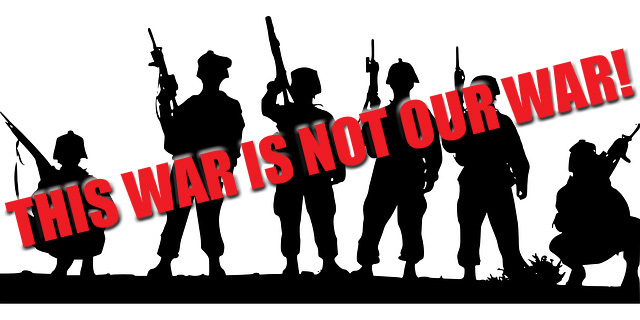 Ordinary people have never in history asked for a war, and they are among the biggest losers. Millions of soldiers and innocent civilians lose their lives and countries will be set back decades by destroyed infrastructures. I have never in my life heard about a referendum for war? Why not give it a try? Some people in this world have fostered dangerous illusions about the very nature of military forces by justifying a destructive war machine that is designed to threaten or attack about anybody anywhere in combination of neocon and humanitarian interventionist ideology. The humanitarian interventionists appealed to Americans desire to be a force for good in the world. Some powerful people have sold the idea that the world must be dominated by US military power if they want to preserve their way of life. Diplomacy and peacemaking between U.S and USSR led to a 33% fall in global military spending in the 1990`s. A commitment to peace and disarmament today will set this planet on a more peaceful course.